The Perrier Legends Trophy tournament, which is taking place during the second week of the French Open, brings together former champions who have gone down in tennis history on the courts at Porte d’Auteuil. 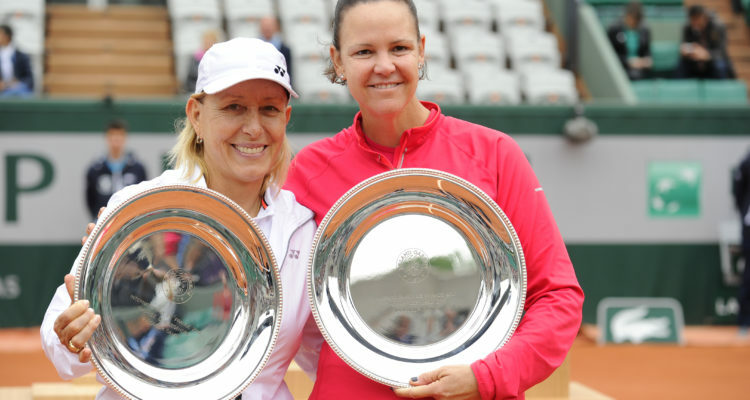 The winners of the women’s title this year are Martina Navratilova and Lindsay Davenport. They defeated Conchita Martinez and Nathalie Tauziat on Saturday on court Suzanne-Lenglen 6-3, 6-2. For Martina Navratoliva, this win brings her total trophies to four in this competition, after her victories in 2010 (with Jana Novotna), 2014 and 2015 (with Kim Clijsters). In the men’s draw, the Under-45s final will be played on Sunday between the French pair of Sébastien Grosjean and Fabrice Santoro as well as Spaniards Juan Carlos Ferrero and Carlos Moya, the title-holders. For the over-45s, the final match will see Sergi Bruguera and Goran Ivanisevic taking on Yannick Noah and Cedric Pioline. This entry was posted in Grand Slam, Roland Garros and tagged French Open, Lindsay Davenport, Martina Navratilova, Paris, Perrier Legends Trophy, Roland Garros.